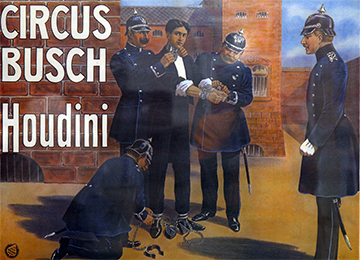 Houdini makes for one of the best role models one can find. Born into poverty, he began work at an early age, and sent the bulk of his money to his family who were living in Wisconsin. This enabled them to join him in New York. He loved sports and realizing the importance of staying healthy, her never smoked, drank or took drugs. This enabled he to do fantastic feats of endurance and strength throughout his life. Loyal to friends and family, he created a career for his brother as a competing escape artist, married his wife Bess, with whom he stayed throughout his life, and bought a 23 room mansion in New York. He took care of his mother after his father died at an early age. He was loyal to his country. When America went to war, he attempted to join the army, but was just a bit too old, so he took a year off to sell war bonds, and support the Red Cross. When he found out our troops were being captured in Germany, he set up classes to teach our soldiers how to escape from German handcuffs and jails. When he found our deep sea divers were loosing their lives under water, he invented a deep sea diving out fit from which it was possible to escape from instantly, to save lives. He exposed crooks, con men, and thieves every where he went. He cared and gave back to the world he lived in. Each of our school assembly programs drive home the importance of the six pillars to character ... trustworthiness, respect, responsibility, fairness, caring, citizenship. 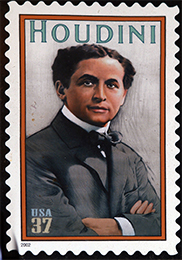 Houdini is honored and admired because of his accomplishments and strength of character. His favorite saying was, "My brain is the key that sets me free." Although he could have made more money claiming to be supernatural, he always told audiences that all of his magic could be done by any one with the same training and knowledge. He dislike when others used trickery to cheat people. He even wrote a book entitled "The Right Way To Do Wrong," that explained how crooks used deceit and trickery to cheat people. He respected himself and others. 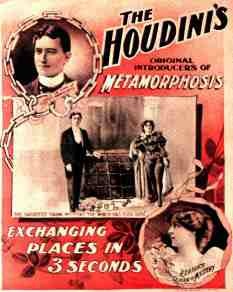 After Houdini died it was found that he had helped to support several destitute magicians who were in need of help. He also paid for the upkeep of the graves of many magicians of the past whose graves were in disrepair. Those around him found him to be the loyalist of friends. Loyalty to family was an important aspect of his life from his earliest years. Realizing his family was poor, he left home at the age of thirteen to seek his fortune. He ended up in New York City working in the garment center in a sweat shop earning pennies a day. Yet he send money home to his family that enabled them to join him in New York. Before his father died before Houdini became successful he promised his father to take care of his mother throughout his life, a promise he kept. When he became famous, he taught his brother all of his secrets, allowing his own brother to become his greatest competitor. He married but one woman, Beatrich Rahner, who stayed together till he passed on. He knew the importance of responsibility. Realizing the importance of being in shape, he never smoked, drank or took drugs. He knew the importance of doing things to their fullest. He strove to be the best at everything he attempted. His pursuit of excellence made him the greatest escape artist and magician of all time. He, in his lifetime, amassed the largest and rarest collection of posters, books, playbills and material on theater, show business, magic and related arts ever amassed. Larger than libraries and Universities. 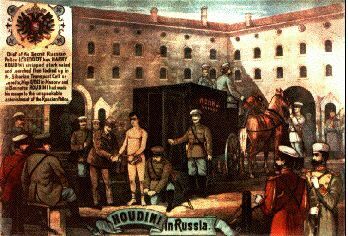 When he died rather than giving it to his family or having it sold, it was given to the Library of congress that keeps it in an area called the Houdini Room. In his pursuit of excellence he even learned to fly and became the first person in history to fly a plane in Australia. He was a pioneer aviator. He was fair to the people around him. 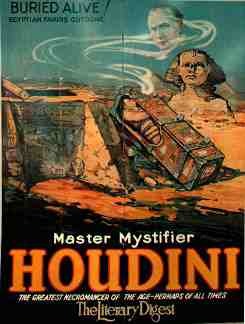 If one looks at Houdini's early posters he did a very unusual thing for magicians of the day or for this day as well. If he mentioned himself in a poster he mentioned her. If he had three pictures of himself, he had three pictures of her. Houdini wanted to share his knowledge with others. He published a magazine and wrote several books on magic and escapes. 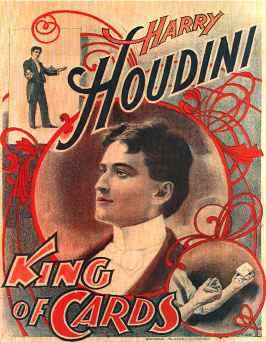 He helped to promote a small organization of magicians call the Society of American Magicians. It started with a small group of 13 men meeting in the back room of a magic store in New York City. He even paid for banquets in cites all over the world to have magicians come and learn about the new organization. He even became its president for almost ten years until he passed away. By the time he died it had over 2,000 members and has never gotten bigger, and is a very well respected to this day. He even left a large sum of money in his will to the organization. Houdini cared for those around him. He also gave back to society, realizing that being successful it was his duty to use what he had to benefit others. This is why he donated his large collection to the Library of Congress. He took care of his wife, mother and brother. He willed all of his magic and escapes to his brother. When he found out that deep sea divers were loosing their lives underwater, he invented a diving suit that one could escape out of instantly should they be in trouble. In England when working a town where he saw children on the streets without shoes, he went to a local shoe store, and bought shoes for every child in town. 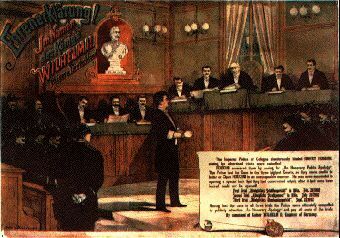 Houdini gave back to the community that he was in. He supported and helped develop the Society of American Magicians promoting it as he traveled throughout the world. He became its president and even took time every month to write their monthly journal. When we went into World War I, he volunteered for the Army. When they told him he was too old, he took a year off to sell war bonds and support the Red Cross. When he found out our soldiers were being captured in Germany, he set up classes in New York to teach our soldiers how to escape from German jails and handcuffs, giving away many of his treasured secrets. It is even believed he acted as a spy as he traveled the world. 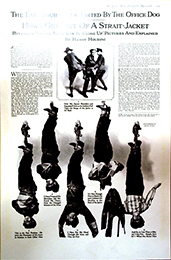 Below are a few of the Houdini posters that will be on display as part of this exciting presentation. (circa 1895) His first poster. Mostly navy blue and rose. 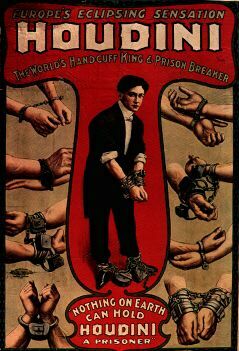 19" X 22"
Poster-Houdini "The World's handcuff King and Prison Breaker" (circa1906) Full color. 22" x 30"
Poster-Buried Alive. (circa 1918) Full color about 22" x 27". Poster-Trial in Germany. Full color about 18" x 24". 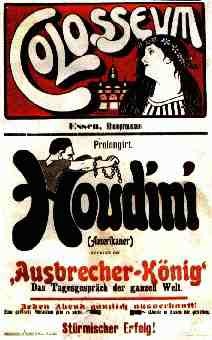 Poster-Houdini in Russia. Full color about 18" x 24". Poster-Water Torture. Full color. Approx. 20" x 27"
Poster-Colosseum. Full color about 22" x 27".